In our neighbourhood, there’s one sure sign that Winter is approaching – the closing of the local Dairy Queen. It’s a sad event that means cold winds, flurries, and numb extremities are just around the corner. I love our Dairy Queen. It’s been a Manor Park fixture for more than 40 years, and comes complete with a big old-school neon sign. On hot summer nights, it’s usually packed with kids getting a treat after soccer practice. Since the adult video store, the pawn shop, and the bingo hall vacated the strip mall around the corner, the DQ has become my favourite part of the neighbourhood. Usually I’m on tour when the DQ closes, so I was determined not to miss this year’s final day. On Sunday night, with the temperature hovering around zero, we bundled up the boys and went for our last fix until March. 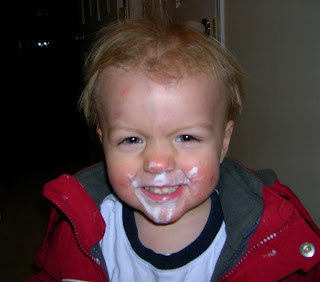 As you can see in the photo below, Kieran really enjoyed his ice cream cone. 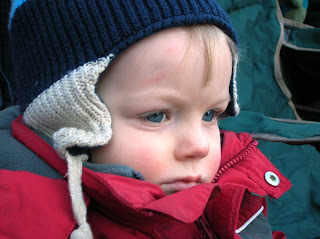 While I’m at it, here’s another picture of Kieran, which was taken during Saturday’s Santa Claus parade. Yeah, he’s a cutie. When I was a kid and lived in Ottawa, we used to go to that very same Dairy Queen. In fact, I’m sure it’s the same sign so I guess it is “old school”. There weren’t that many Dairy Queens’ open back then and soft ice cream was a new thing. I used to have a whistle that was shaped like a little ice cream cone. I’ll be that bit of memorablia might be worth something if I still had it. We used to get in the car and we’d sing their catchy little jngle……Let’s all go to the Dairy Queen………..
It’s nice to think our little grandboys can experience the same pleasures that I did at the same place! Wow. The Dearlove genes sure do run strong don’t they?